Provide terms & conditions and contact details for support related enquiries. Add the terms and conditions for your digital stamp card. We've provided some text as a suggestion / starting point. But, you can delete this text and enter your own Terms & Condition, or simply amend the text to align with your loyalty program. Change "Collect 8 stamps to receive a free large coffee upon your next visit" to "Collect 12 stamps to receive 10% discount off your next bill". Basically, you have complete freedom to change the terms and conditions to fit your business and your loyalty program design. Be sure to change the suggested text to the Terms and Conditions for your program before you start promoting your loyalty card. 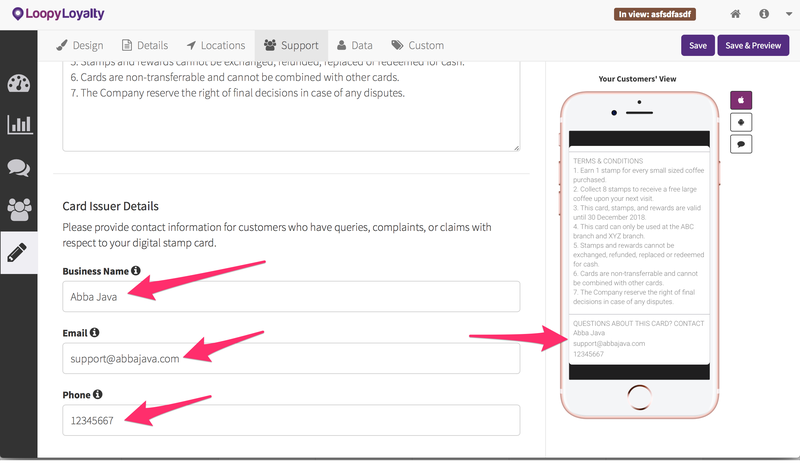 By default, the text you enter in the Terms & Condition field will appear on your digital stamp card and on your customer enrollment page. If you don't want this to appear, you can disable it by un-toggling 'Enabled'. 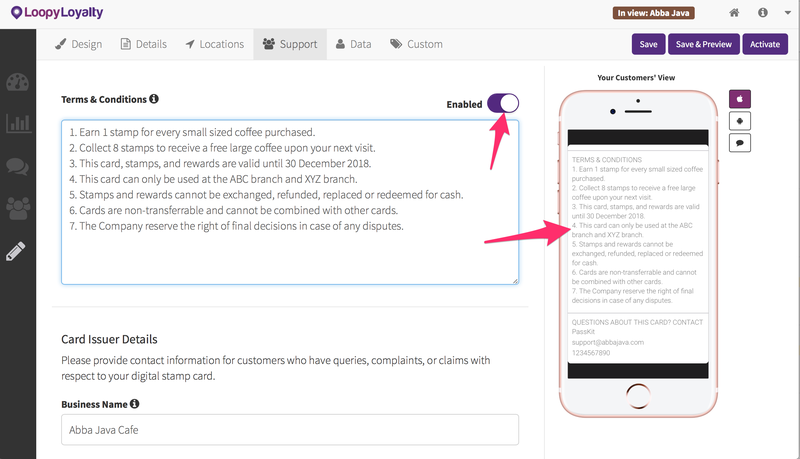 Provide contact information for customers who have queries, complains, or claims with respect to your digital stamp card. All of these details will appear on the bottom of your card.